I was thinking about what picture would symbolize 2006 for me, and well, the fact is, it's got to be GuildWars, because I spent an awful damn lot of time playing it this year. This picture is another one of the Wintersday quests. (Big version here.) 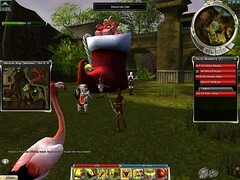 That's Mila, my ranger, standing there with the bow as big as she is, and that's her pet flamingo in the foreground. (The flamingo is named Irma, and she's not just a flamingo, she's a combat flamingo, because that's what pets in GuildWars do. When you attack somebody, she goes squawking in, wings flapping and pecking away. Seriously, she does. She can do a fair bit of damage, too.) The big guy with the 'fro is Koss, who is one of the Nightfall "heroes" - a non-player character. And standing next to the giant stocking, looking very white indeed, is Columbine's necromancer Allium. There are characters called Margonites in the new game which are sort of shimmery and whitish (and transparent, actually) and we have been saying that Allium looks an awful lot like a Margonite in that armor. I will have to look up how much time, exactly, I've spent playing this damn game, and report back. It's a lot. Well over a thousand hours, I think. But GuildWars - and columbina - were two of the things that got me through what was otherwise a pretty difficult year. So I spent 20% or so of the year in a fantasyland - so what. It's a lot better than just spending the year watching my mother go downhill.